See the story behind the awesome gift here. Tom Hanks has proved what a legend he is yet again, by gifting a fan with a signed typewriter. It all started when the Big actor - who has a penchant for retro word processors - was given a Moleskine sketchbook by mega-fan and artist with all his film roles inside. And as an extra little touch, Denise Esposito even added an illustration of a typewriter, with the words "to be continued..." on it. Hanks was so moved he sent her an awesome gift himself, complete with a personalised note (written on a typewriter, of course!). 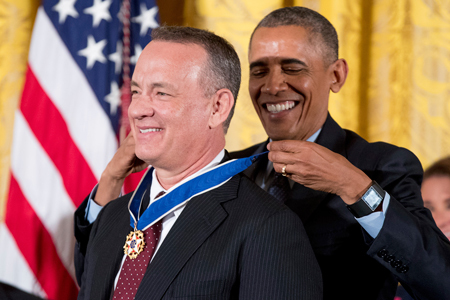 Meanwhile Hanks was among this year’s recipients to receive Presidential Medal Of Freedom yesterday (22 November). Obama also honoured the likes of Bruce Springsteen, Bill Gates, Michael Jordan and Ellen DeGeneres at the ceremony, which tookplace in the East Room of the White House. DeGeneres has since posted her attempt at the Mannequin Challenge at the historical building, with the likes of Springsteen and Robert De Niro getting involved.